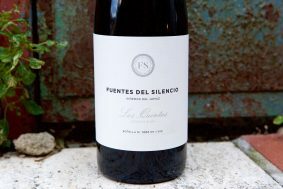 The story of Fuentes del Silencio is of Indiana Jones-level proportions for lost and nearly forgotten wine cultures. Miguel Angel Alonso and his wife Maria José Galera, retired doctors and hobby winemakers, have stumbled on and excavated one of the rarities of the wine world. 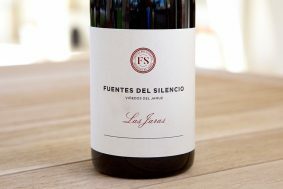 In the south of Leon province, up on the high plains of Herreros de Jamuz, among forests and fields of shrubs, they discovered the ancient Mencia vineyards buried underground that predate the phylloxera epidemic. There they started a rescue mission, restoring many of the old vines and putting them back into production. 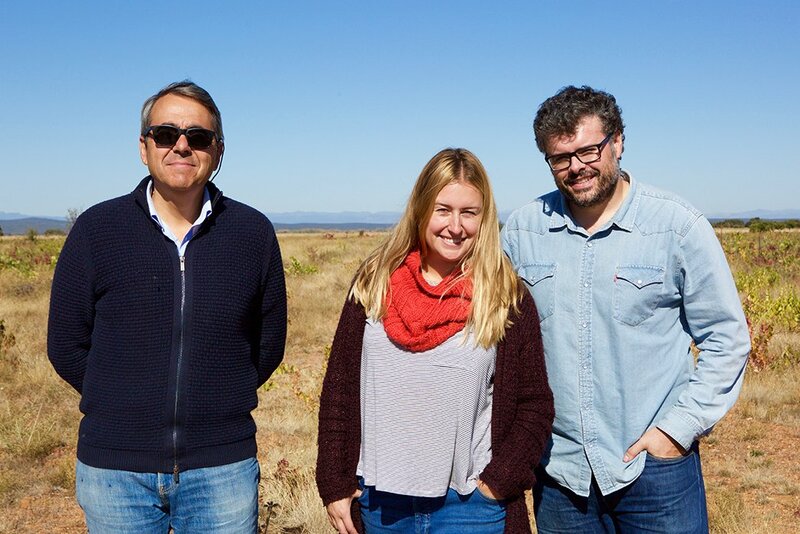 Miguel and Maria developed a team of passionate wine professionals (Marta Ramas in the center and Miguel Fisac on the right) who seem more like archeologists. They’ve have taken on the task of bringing this Spanish treasure trove back to its former glory with a minimalist approach in the cellar. 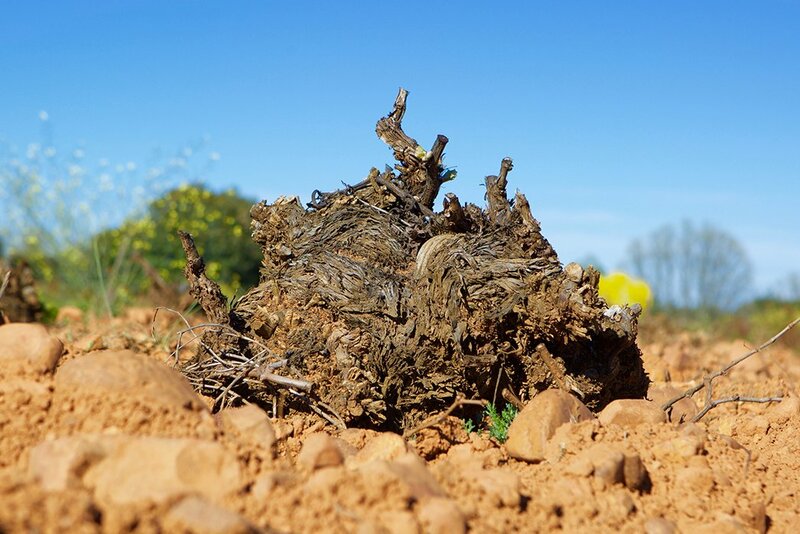 The youngest vines of their collection of parcels were registered as planted in 1930, but the locals told Miguel that the oldest set of vines were planted by their granfathers closer to the turn of the century, after phylloxera had passed through. I’ve seen a lot of unique looking vines, but I’ve never come across anything that looked like hairy little square animals, dug into the ground, with vine shoots sprouting from their backs. This new project started from zero only a few years ago and all of their winery and production equipment is new. Their idea is to slowly pepper in 500-600 liter barrels each year until all the wines can be aged in the larger neutral oak vessels; they don’t want new wood in the cellar but they also don’t want to buy old barrels from other cellars. Miguel’s vision is to find the greatest degree of elegance and purity with these organically made, whole cluster wines, while not sacrificing their ability to age gracefully and improve in character with time. The village of Herreros de Jamuz is in a valley and sits near the border of Spain’s most lush stretch of land known as “Green Spain.” To the north, the snowcaps of the Cantabrian mountains are visible, while not far to the west, the eastern end of the ancient granite Galician massif begins. 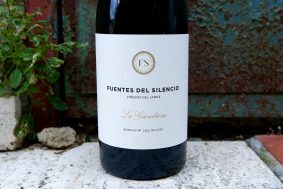 Fuentes del Silencio’s vineyards sit between 800 and 900 meters in altitude and are completely exposed to the elements in a desert filled with short, extreme weather-resistant aromatic plants like lavender and thyme, as well as many different varieties of shrub-like short trees. The arid and extreme seasonal shifts make for perfect high-quality grape growing (despite astonishingly low yields that range from 0.40 to 1.2 tons per acre), with little pressure from pests, mildew, botrytis, frost and hail—most of which stays in Galicia. Gold brought the Romans to Jamuz and it’s believed that they first planted vines there over two thousand years ago. The Romans have always had a knack for finding the right kind of dirt for the vine and Jamuz was no exception. The area is extremely arid because the surrounding mountains squeeze the rain and snow out of the clouds from the Atlantic into Green Spain before they make it to the desert. The Jamuz River brought in alluvial deposits of decomposed slate and limestone in the form of silt and clay that is rich in iron—a great combination that helps with water retention in this dry land. Inside of the region’s ancient caves it’s easy to understand the soil structure. The walls are a semi-hard tan clay with pinkish spots (from the iron) and always damp. This region brings acidity to Mencia which makes this varietal almost unrecognizable in structure, but not in taste. All decisions made in the cellar were subordinate to the exploration of these wines with very little influence of enological techniques and fashionable trends. They are a must for those in search of forgotten regions with truly noble wines.